Have a bar installed in your New York basement. Marshall Exteriors can install a bar in your basement that will serve as an extra recreational space for family and friends. A basement bar is a great way to enjoy all the social aspects of being at a bar without ever leaving your home, and it can come with all the customized features you desire. We offer basement finishing and basement bar installation throughout Fairport, Canandaigua, Geneva, Newark and surrounding areas in New York. Contact us today to schedule a free on-site estimate. So how do you go about bringing this distinctive new space into being? Marshall Exteriors encourages you to follow the 7-step process described below. Consider the layout. Think of how you want your bar to look. Keep in mind that certain areas may be a necessity such as a sink, counter space, liquor storage, and seating. Working with one of our design consultants to determine the proper layout that fits your basement will be extremely helpful. Sound control. As we all know, recreational activity can be quite loud. It's smart to consult with your basement finishing contractor to be sure that your basement bar has the proper wall insulation to create a natural sound barrier for your basement space. A suspended ceiling can even be an option to further isolate your basement from the rest of the home. The right materials. It is important to be mindful of the materials you will be using for your new basement bar. Here at Marshall Exteriors we can install easy-to-clean, durable surfaces and cabinets that will provide functionality and aesthetics. You also want to make sure there is enough wall space to mount a television if you wish to do that. Our professionals install waterproof basement wall paneling where a TV can easily be mounted. Plumbing is a nice option. Adding a sink to your basement bar and possibly a small bathroom definitely adds a nice touch to your basement area. The extra plumbing work makes your basement bar very self sufficient; there's no need for periodic trips upstairs. Thanks to special pumps and other innovations, basement bathrooms have become easier and more affordable to install, so this option is definitely worth considering. Talk to your basement finishing specialist about our plumbing options available. Consider the floor. Like any bar, your basement version will benefit from a finished floor that's durable, waterproof, easy to clean, and also pleasing to the eye. No product scores higher in all these areas than ThermalDry® flooring from Total Basement Finishing. ThermalDry® flooring tiles offer the appearance of different wood or tile floors with the durable, waterproof, maintenance-free characteristics of high-strength plastic. The right lighting. Marshall Exteriors can install the proper lighting for your basement bar. We offer suitable lighting options such as recessed lighting, compact flourescent lighting or LED lighting for added energy efficiency. The final touches. Last but not least, you'll want to personalize your new basement hangout with pictures, pennants, trophies and other items that can be hung on the wall or displayed on shelves. If you've dealt with all the details mentioned above, you'll get plenty of satisfaction out of this final step. Marshall Exteriors can install a high-quality SaniDry™ dehumidification system to control the humidity in your basement. This will create a safe, healthy basement environment that will allow your bar to remain in great condition. Our basement finishing design ideas are available with a free estimate. 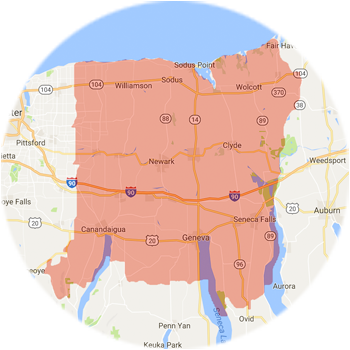 If you live in Geneva, Fairport, Newark, Canandaigua or nearby, call us today for an on-site consultation!